Looking to sell? We are always interested in buying good quality vinyl & CD's, so please do not hesitate to get in touch. 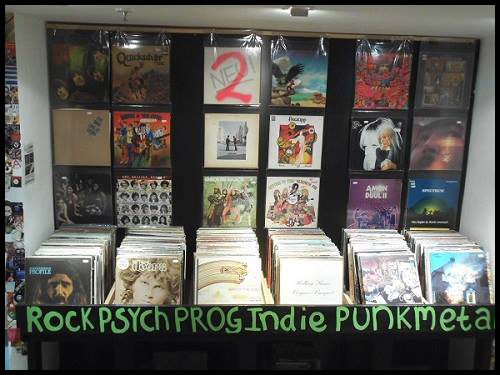 We stock an extensive range of second hand vinyl with sections for Jazz, World music, Reggae, Soul/Funk, Hip-Hop, Dance/Electronic, Soundtracks, Classical, 78's and a central stand dedicated to Prog, Psych, Classic Rock, Punk/Post-Punk/New wave, Indie and Metal/Hard Rock and many more! We also stock new vinyl with a mix of current releases and classic back catalogue titles. We can provide a custom ordering service for both Second hand and new vinyl if required. We also have an organised and extensive 45 section in our upstairs level with hundreds of titles to be found, as well as a large and varied £2 section and £1 boxes. We are now operating an online Discogs shop upon which we will be listing a range of valuable and rare titles for sale. Please click the Online Shop tab at the top, and scrowl down and click the listed link to visit our Discogs shop. We have a broad range of second hand CD's with genres ranging from Alternative Rock and Indie, to Metal, Punk and most genres inbetween. We also have specialist sections for Soul, Funk, Reggae and Hip-Hop. Prices starting from £2! with plenty of bargains to be found.